Remember when Rawkus Records had the great hip-hop music with substance? The Procussions aren't it. Competent. If I had to write this review with only one word, it would be "competent". Nothing more. Remember when Rawkus Records had the great hip-hop music with substance? Company Flow, Black Star, Pharaohe Monch? The Procussions do, and they use this to their advantage. "Rawkus went against the grain... they signed MCs who pushed the musical envelope," they say on their website."... Rawkus is back on the scene to push The Procussions into the forefront." They try their very best to fulfill the impressive legacy: their lyrics are conscious without coming across as overly preachy, and the in-house production from Stro does carry its own distinctive sound. 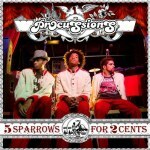 But as their latest release (and first on Rawkus) 5 Sparrows for 2 Cents, demonstrates, the problem remains that the Procussions are -- wait for it -- simply, sadly, boring. Let's start with the production. Stro is a competent producer, making solid vibes of beats that each have their own individual feel but retain the essence of his overarching style. "Miss January" is a lightly poppy guitar beat, "The Storm" is heavier electric guitars and squealing high-pitched electronic noise, "Carousel" puts the guitars in chaotic reverse before proceeding to add warbly synths and fuzz. But just like everything else with the Procussions, while the production is skilled and solid, it's hardly memorable. None of these beats will stick in your head, and their overtly-poppy, Black-Eyed-Peas-lite flavor ends up feeling like somewhat of a disappointment coming from the new flag-bearers of what was once the home of so much dusty, underground boom-bap. The MCs here are even less interesting. They flow decently but are, once again, completely indistinguishable from the legions of other merely "good" rappers. They have a generally positive message, just like all those other neo-soul head-bobbers, and they seem like they enjoy what they're doing, judging from their easy enthusiasm. Hell, I wouldn't mind letting any one of them date my daughter. On the other hand, I could not find any truly memorable quotes to include in this review. None. This is not remarkably uncommon, but neither is it a good sign at all. They can do some things impressively; the track "Little People" is a highlight, rappers Rez and Mr. J. Medeiros doing some of their best work for the album over a strongly atmospheric beat with high-pitched sampling from Stro. It holds promise, but not enough to justify the rest of the songs here. Songs that don't go wrong, that make no mistakes, but at the same time perfectly self-efface -- which is fatal, especially for a group with this much slick financial backing (see the elaborately stylish album artwork). It took so many listens to write this review precisely because, after each spin of the album, I could remember so little of distinct interest. The Procussions are entirely harmless, and there's no doubt that what they're doing is healthier than any number of the poison-mouthed studio gangstas flooding traditional media outlets. Is it so bad to be unexceptional, then? In a world with so many beautifully idiosyncratic, interesting artists suffering below the surface without the attention they deserve, the answer for music fans is yes.